The JOIDES Resolution is drilling in more than 4 km of deep water in the Amundsen Sea and we are surrounded by icebergs every day. This provides for some beautiful scenery, but it is not always good for drilling if they are coming straight at us! Several times over the past few days we have had to pull out of the hole with the drillstring, and move the ship out of the way of a passing iceberg, and we are now in our third hole at the same site. The good news is: we have recovered beautiful complete cores going back in time several millions of years including through prominent warm periods. These archives of the ice-sheet’s history will allow us to retell the story of how the West Antarctic Ice Sheet behaved in the past under warmer conditions. After some foggy days, which were really difficult for the ice watchers, the weather has cleared and the ice watchers can better track the movement of icebergs. The ice watchers, which include the captain and his crew, use three different ways to make sure an iceberg is not impacting the ship. First, they use satellite images to map the track of large icebergs. However, smaller icebergs are not visible at the scale of the satellite images they use. So, for smaller icebergs down to a size of approximately 5 m across and more than 1 m high, the shipboard radar is used. Individual icebergs are numbered and their tracks are mapped on the radar. Lastly, icebergs that are less than 1 m high above the sea and less than 5 m across, so-called growlers and bergy bits, are difficult to observe on the radar. These smaller icebergs are spotted by eye from the bridge. 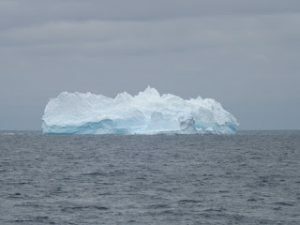 The smaller icebergs have been causing us the most trouble in the fog, but now that it has cleared we are back on track. Cores come up in 10-m long segments every few hours (“Core on deck!” on all speakers). In the photo you can see the 10-m long tube with sediment (the core) being carried onto the catwalk by the core technicians. On the catwalk the core is cut into 1.5 m long sections so that it can fit through the shipboard labs. The sediments are hard now, and core sections are being split in two halves with a motor saw, whereas previously the soft mud could be cut with a wire. 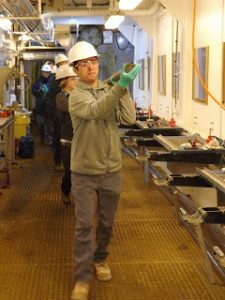 After piston coring for more than 200 m down into the sea floor, we are about to change over to the XCB rotary coring system to drill farther down into the rock and to uncover the early history of the Amundsen Sea’s ice behavior.